Though my favorite tools for drawing and sketching are pencils and fountain pens filled with black ink, once in a while I would sketch with colored pencils too, whenever I am bored with drawing monochrome, or when I am just adding accents of colors to my sketch. In contrary to most people, there are many artists out there who have considered color pencils to be a serious art medium, and not just for school kids or children learning how to draw. I do feel that colored pencils are ideal for anyone learning to draw and those who are drawing professionally. Over the years, I have used quite a few brands of colored pencils, including Prisma colored pencils which have delivered quite good results, but I am looking for something softer. Then I stumbled upon Derwent Colorsoft Colored pencils when I was browsing the local art stores at the dry medium section recently. Out of curiosity I bought a few colors just to try out. I wasn't surprised to see how the Colorsoft colored pencils are so soft to the touch, as the name has somewhat implied. The softness of colored pencils is the one property that I have regarded to be of utmost importance, besides lightfastness and color permanence which are some qualities other artists have considered important too. It is like using a soft grade graphite pencil (e.g.. 6B and softer). The pigment got transferred easily without too much fuss or working over the support. Since I love to sketch fast, such property easily helped me to sketch very quickly without looking over my drawing all the time or exerting too much pressure while drawing. Since they are so soft, these pencils (Colorsoft) enable easy blending and burnishing and working with many layers. I do think that the Colorsoft colored pencils are softer than Caran D'Ache Luminance and Prismacolor pencils. After I tried the initial 6 colors I bought, I love them so much I bought a box of 24 colors. After testing, I derived the following benefits of using Colorsoft; able to active soft gradients; fast coverage (even with heavy strokes); and quick sketching even with strong lines; they glide smoothly on any kind of support; work well with other colored pencils and medium even with ink; they also feel like paint while I work with multiple layers at one time; while I can achieve quite opaque and bright colors with them. If I need a one-stroke accent, Colorsoft will go on thick and "pop" in the colors. They also allow me to add on moist paper with either water or watercolors. Further more, since the pencils are made quite fat and round probably with more wood to protect the core, they have less internal breakage. I have been transporting the colored pencils in a plastic box with lots of movement within, but so far none of them broke when I sharpened them. The last thing you want is to have internal breakages in these pencils while you work with them. The core doesn't break easily too even when I sharpened it into a very sharp point and pressing into the paper. The following are the sketches I did with the Colorsoft colored pencils. For the above sketch, I did the outline with a Muji fountain pen and overlay with colored pencils. I worked direct with Colorsoft colored pencils for the above and then added more drawings with a fountain pen. Instead of using a graphite pencil, I used several Colorsoft colored pencils to lay in the sketch. Then I painted over with watercolor. See below for a detail portion of the sketch. Here's a video from Lachri for another opinion on these pencils. Search Jackson's Art Supplies (UK) and Utrecht Art Supplies (USA). for price comparison. Thanks for this review. I love my Prismacolors but since they aren't sold in Hong Kong, and I need something similar for my work, thanks to you, now I know what to get. These are available locally, but I haven't sought them out before as they are a brand I was previously unfamiliar with. Turned out this brand has a long history too. great review and beautiful sketches! Great review of these fantastic pencils and great sketches indeed. Me also I was taken ercently by these colors finding a replacement from Prismacolors. I spotted to great alternatives, I don't know if you know them. 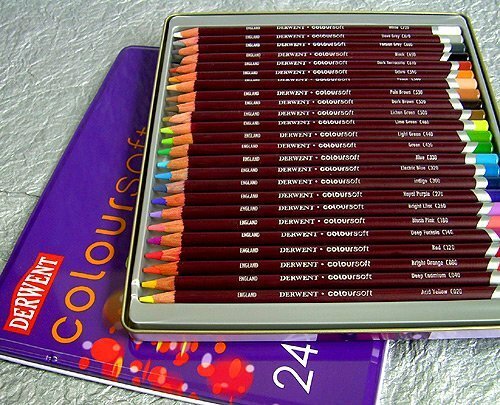 Koh-I-Noor PolyColor, very similar to Prismacolors and these Derwent ColorSoft. Needless to say that I don't miss Prismacolors. For even more carefree sketching jsut try some of the faber-Castell pencils. High in hardness but affordable and washable. Thanks a lot for the article.Now I know what brand of colored pencils to buy ! Are there? It might be a marketing thing. Companies may not sell their art products in all countries making it difficult to for customers to buy their product.